There are a lot of great tutorials on Null Byte using Python to create backdoors, reverse shells etc, so I thought it might be worthwhile making a tutorial on how to convert these python scripts to exe files for Windows victim machines. This is the python script that py2exe uses to create your exe. I think it's fairly self-explanatory. Make sure you save it in the same directory as the file you want to compile. Note, if you are using any third party python modules, you must specify them in this file. Py2Exe will have created two folders: build and dist. The dist folder contains your exe, and it's safe to delete the build folder. Py2exe is available on windows. I tried to do the same. I get an import error while running from cmd. But when I run the same script in idle . It shows no error and no output is displayed. Hmm, that's odd. Do you have multiple versions of python installed on your computer? I am using a package selenium in my python code and created a setup file as mentioned. I got an error as below. i am also facing this error. IndexError:tuple index out of range! "tuple index out of range"
I want to use standalone .exe in different directory , not in a dist folder. what should i do? The online convertor works fine and easy. Thanks. 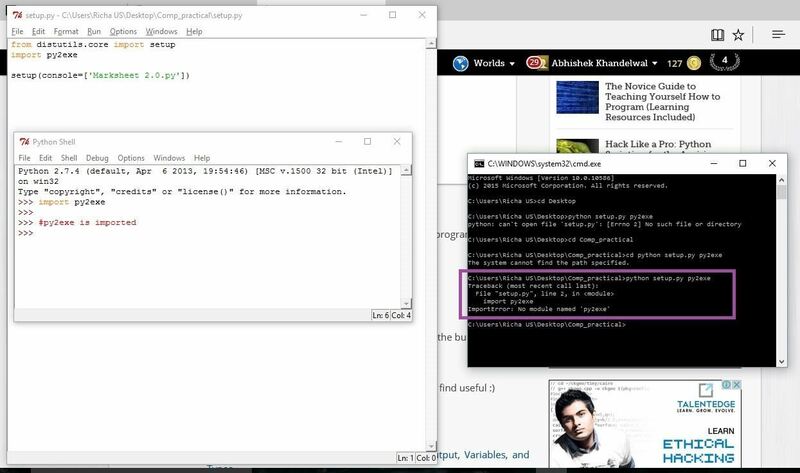 Hi, I've just read this tutorial and I'm wondering (once the python program has been converted to .exe) what if I modify some of my scripts and / or add a new script, is there a way to "compile" or "update" the .exe? I've developed a tool that was distributed to some clients and I don't know if I can just "update" that tool with my new modules.